If you have already converted an estimate, then your invoice is ready for payment! If required, you can edit your line items and add new product and services. InfoFlo Pay allows you to create new invoices with just a few clicks! Customers can be selected from an auto-fill drop-down list or created on the spot. Then simply add your products and services from an auto-fill drop down list and even create new product and services, all from the screen. It doesn’t get any easier! InfoFlo Pay is fully integrated with Mailgun, one of the most widely used 3rd party email services. Since email providers recognize Mailgun, you can rest assure that your customers will receive your invoices and overdue notifications and in their inbox, rather than spam, which helps you get paid faster. 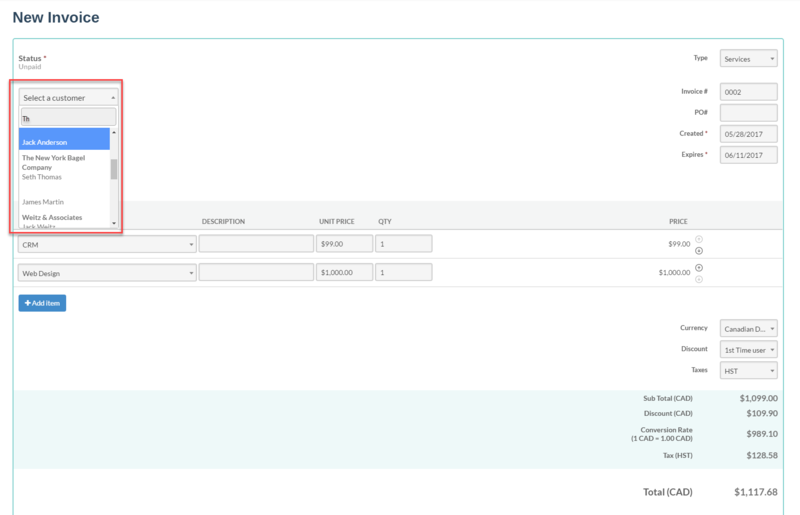 Once an invoice is sent, the customer receives an email with a unique customer portal link allowing anytime access to the unpaid invoice. When clicked on, the customer is automatically logged in to their portal with a “Pay Now” button appearing above a PDF version of their unpaid invoice. Instantly accepts payment over the phone or let the customer process their own credit card through the customer portal. Since InfoFlo Pay is fully integrated with one of the largest payment processors in North America, a credit card is securely processed in seconds. Automatic payment notifications allow your customers to stay stress-free. InfoFlo Pay allows you to search and sort by estimate number, date, name, and company as well as filter by status. Know whats happening with every invoice, so your always prepared. 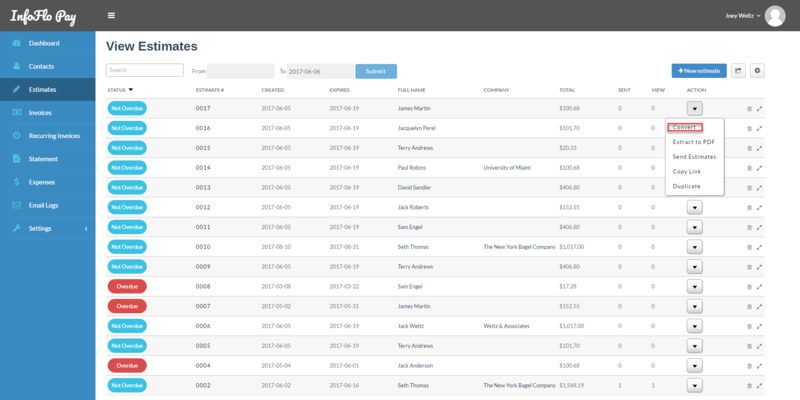 Want to see how many times you've sent an invoice? Was it viewed? InfoFlo Pay can event send you an email notification when the customer is viewing the invoice! Invoices should be clean and easy to read. 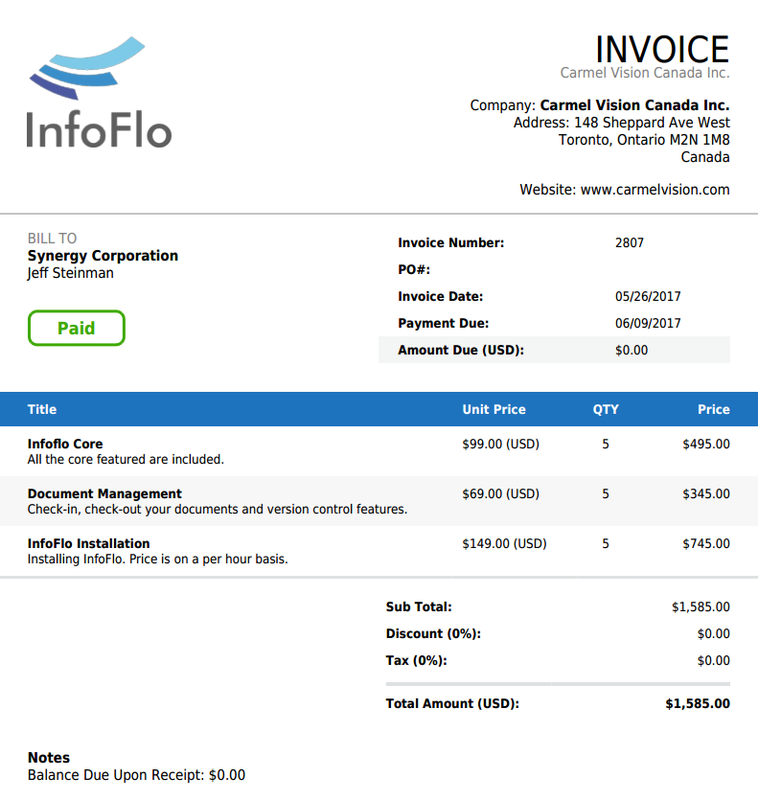 InfoFlo Pay Invoices clearly show all invoice information, including Currency Conversion, Total Amount, Amount Due and a Paid stamp when the invoice is paid in fill. 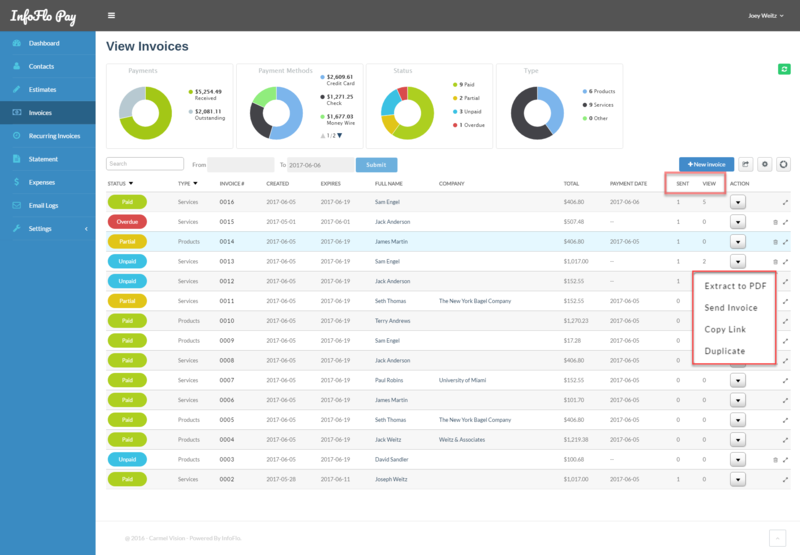 As with estimates, invoices are fully customizable to include all of your company information.